Whether I’m setting up a brand new WordPress site, or optimizing an existing install, I always visit the settings first. If it’s a fresh site, I want the settings to be right from the get-go. If it’s a site that needs help, a glance at the settings often tells me what needs optimized first. 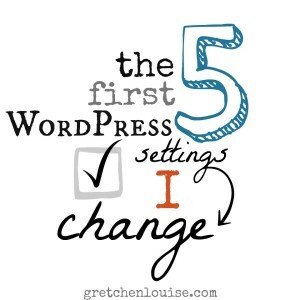 So come look over my shoulder as I explain the first five WordPress settings I change. 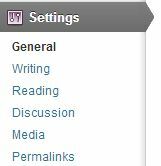 First stop in a new WordPress dashboard is the General Settings area. 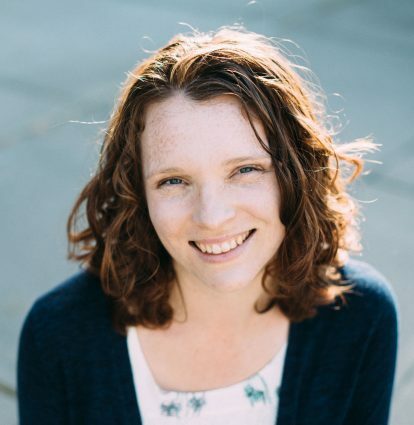 Fill out your site title (if you’re using personal branding, this is your name) and your tagline, if you have one (if you don’t have a tagline, leave it blank—don’t leave “Just another WordPress site” there!). Your site title and tagline are important for SEO, so be sure to fill them out; don’t remove them just to get the text off your header image (that’s a job for custom CSS). Don’t touch your WordPress and site address unless you know what you’re doing—you’ll likely break your site. The email address should usually be the same one as that in your user profile (unless you want site-related notifications to go to another email address). Don’t check “anyone can register” unless you want to give hackers front-door access (or you have a membership site). Once you choose a permalink style, you don’t want to change it often. Changing permalinks not only resets your social share/like counts to zero, but it can also break previous links to your site as well. 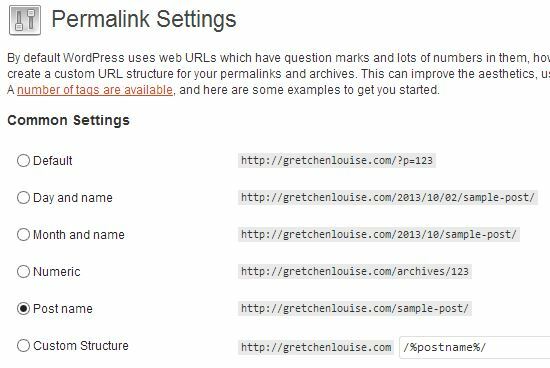 If you’re setting up a new site, choose a permalink style other than “default”. My preference is “Post name”, but depending on your site, you may have a reason to choose a different permalink style. If you want to change the permalink style of your current site, click here for more details on how to create the necessary redirects. 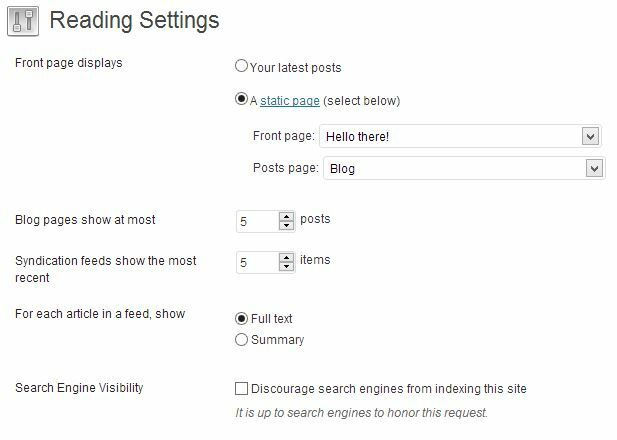 If you want your latest posts showing on the front page of your site, you don’t have to change anything in Reading Settings. But if you want a custom home page or special template style to show on your front page, this is where you’ll change it. 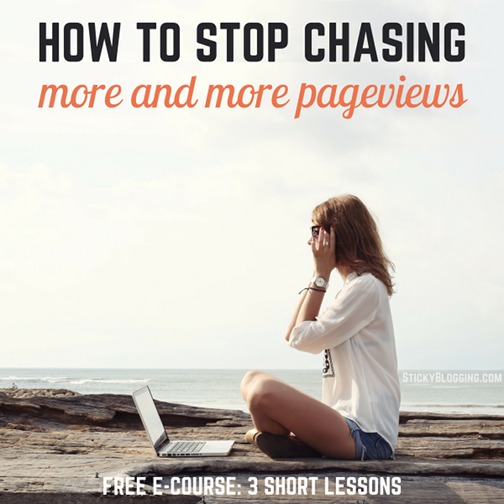 Depending on your theme, changes you make here may or may not affect how many posts show on your pages. Be sure not to check the box “Discourage search engines from indexing this site”. When you upload an image to WordPress, it creates at least three copies of it—thumbnail, medium, and large—in addition to the original size that you uploaded. 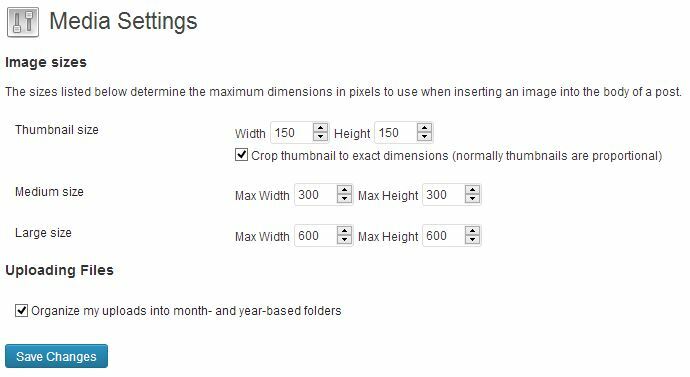 My favorite settings here are the default 150 for thumbnails, 300 to 400 for medium, and 600 to 700 wide for large, with large being the width of your theme’s post area. This won’t change past image sizes unless you regenerate all your image sizes, but it will affect future uploads. Some themes will add additional image sizes to fit the theme’s layout, though they won’t be displayed here. If you change to a theme with custom image sizes, you may need to regenerate your images (with a plugin like Regenerate Thumbnails) for past posts to display properly in certain areas of your theme. If you’d rather your images not have dates in the image URL, un-check “Organize my uploads into month- and year-based folders”—but don’t do this unless you’re just setting up your site or you may break all past image links. Check out this guide from WPBeginner: 25 Most Common WordPress Mistakes to Avoid. Gretchen, although I’m operating on a WordPress.com blog, I always find something helpful in your technical tips. Tonight, for example, you’ve encouraged me to change a couple of things that I can and shown others that make me wish I were on a .org blog. As you can see, I set up my blog with something other than the brand I wish I had, i.e. my name. If after having purchased the domain name healingbywriting.com I decide to go with Sherrey Meyer as my personal branding, will that be beneficial to me even though healingbywriting.com will be in my blog links? Or do I need to purchase SherreyMeyer.com? BTW, the new blog looks nice! Sherrey, I think purchasing SherreyMeyer.com would be a great idea–especially since it’s available! 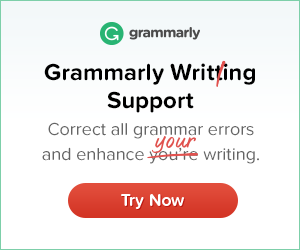 WordPress.com offers options for redirecting healingbywriting.com to sherreymeyer.com. Even if you don’t do that now, I’d recommend purchasing the domain while it’s still available. Glad the post was a help. And thank you for the compliment on the new blog design! Gretchen, thanks for the feedback. SherreyMeyer.com has been purchased! This is my writing year — 2014 goals include finishing my memoir and establishing a solid platform, thus the branding I should have done earlier. Many thanks again! Congratulations, Sherrey! How exciting. 🙂 Thank you for being such a faithful reader and commenter. Have a Merry Christmas and Happy New Year! And Merry Christmas and Happy New Year to you as well, Gretchen! I made a static page for my blog, added a search bar, and have noticeably lost views. I have gained followers at the same rate, the incoming views from Google are still coming, but people aren’t looking around as much. I think I’m going to get rid of the static page and go back to having my recent posts continually flowing on the front page. Interesting! That’s great that you discovered that. It’s all about learning and experimenting, isn’t it? 🙂 Thanks for sharing your findings! I have to admit that I tend to not poke around blogs with a static front page either. Always thought it was just me. Think I’ll change my own! Really great series. I just visited today for the 1st time through Small is Enough blog. Signed up for your posts. This WP series is very helpful. Tweaked a few things at my site already. Thanks. Asking Gretchen to help me was the best decision I could have made!